As the Assistant Manager, Alyssa is the first person you’ll interact with as an Event Floral bride whether on the phone or in person. As a recent bride herself, Alyssa is involved in all aspects of running the studio. She oversees the daily and retail sales, seasonal merchandise and linen rental logistics. She also is involved in the preparation and installation of all of our weddings and events. 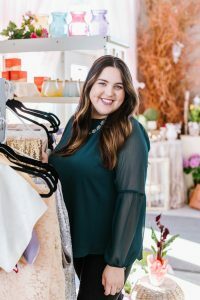 She joined Event Floral in 2017 as a graduate of Western Illinois University with a degree in Recreational Parks and Tourism Administration and Event Planning Management. She has a catering and hospitality background. Alyssa loves helping our customers and is essential to our daily operations.